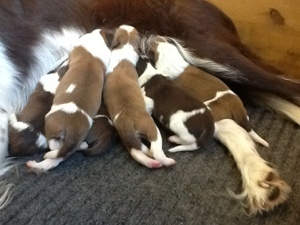 The puppies out of Liz sired by Canen Kane were born yesterday. 6 puppies were born, among them 4 girls and 2 boys. This is Liz second litter, and the puppies from her first litter already show good potential. And this is Kanes fourth litter. We are very happy with the two litters out of Rikky sired by Kane, so there is no reason not breeding Kane to sister Liz also. Seem that these lines are good match. Posted on June 9, 2013, in Everything. Bookmark the permalink. Leave a comment.